That was in the early 1990s. But nowadays, after a period in which the Ugandan army disarmed the Karamojong cattle herding tribes, they can’t defend themselves anymore, he laments. “Bandits come to steal our donkeys and cows. Even now some of our donkeys are missing. Those people are able to steal our animals because we no longer have guns. If we had guns…,” he says, leaving the last sentence hanging. Karamoja is a semi-arid sub-region in the north-eastern apex of Uganda, with a population of 1.2 million people. It shares a border with Kenya to the east and South Sudan to the north, and regularly jostles for scarce water and pasture with nomadic pastoral groups from the two countries. For at least two decades, it has grappled with the proliferation of guns in the sub-region, in turn exacerbated by other armed conflicts such as in South Sudan. According to various studies, the Karamojong first got their hands on guns in the late 1970s, during the overthrow of Uganda’s then president Idi Amin Dada by Ugandan exiles who were backed by the Tanzanian military. Eventually, the attacks spread to neighbouring tribes and even to communities in Kenya and South Sudan. Victimised communities also armed themselves, sparking off a mini-arms race. In the early 2000s the government launched a military-backed operation to disarm all Karamojong warriors. Captain Isaac Oware, who is now the Uganda People’s Defence Forces (UPDF) spokesperson for the army’s division in the north-eastern region, then a platoon commander, remembers: “The warriors were many and armed; the terrain was tough for us, and the climate was rough as well. They (the Karamojong) believed that guns and ammunition were part of their livelihood.” Oware narrates a particularly bruising battle in which the Karamojong engaged the military for an entire day. “We used Mamba and Buffalo armed vehicles [and] heavy guns. They were very many and were organised, with command elements and formations,” he said. When the army eventually broke the back of the Karamojong resistance, the warriors called a truce and agreed to negotiations. The EPRC report says that in the negotiations, weapon holdings were reduced, but “on a varying scale:” “For instance, the Bokora sub-ethnic group willingly surrendered up to 44 per cent of their weapons, while the Jie and Dodoth respectively gave up only 27 percent and 20 per cent of their projected stock.” This, later observers said, created imbalances, whereby some groups still had arms and were raiding those who had been disarmed. And then, the EPRC notes in its report, the whole exercise was shelved. That was because of the escalating conflict with Joseph Kony’s Lord’s Resistance Army in the north of the country. The army’s move to the north “led to an increase in raids in Karamoja” again. 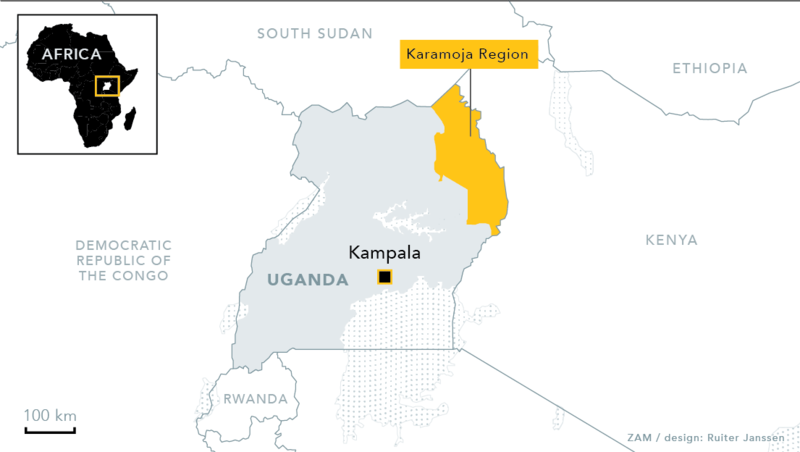 With a first -albeit rickety- truce signed between the Ugandan government and the LRA in 2006, disarmament exercises were again attempted in the Karamoja region. Initially unsuccessful, a “cordon-and-search military operation by the UPDF in 2008 finally netted 30,000 guns,” says the EPRC report. Today, according to Captain Oware, the army is conducting the “tail-end” of the exercise. Perhaps inevitably, killings continue to occur. In February 2017, a group of Karamojong warriors killed three Turkana cattle keepers who had wandered in from Kenya. The Karamojong also took their victims’ cows, donkeys and at least a thousand goats. Uganda was mortified. The army went out to confront the Karamojong, confiscated the stolen animals and duly returned these to the Turkana owners. The Ugandan government, intent on repairing relations with Kenya, then hosted a cross-border bilateral peace meeting on 2 March 2017. It was attended by a 50-member-strong delegation from Kenya, including the Governor of Turkana County, Josephat Koli Nanok, and several legislators. For locals to really benefit from the emerging extractive industries, there should be resource sharing agreements, he says. “Even donors are advocating for alternative livelihoods, besides rearing cows and goats. Local people should be shareholders in the emerging industries so that they get dividends.” He believes a Marshall Plan, with “special scholarships to the Karamojong as a form of investment,” should be implemented in the region. Efforts were made to get comments from the Ugandan government and presidency but none were received in time for the deadline.